Spanish physician Manuel Castillo (left) did a beer hydration study that became sort of a rallying cry for David April (right), co-founder of the Fishtown Beer Runners. Lace up your sneakers and help the Fishtown Beer Runners raise funds for a good cause: the Sidney Kimmel Cancer Center of Jefferson University Hospital. For the uninitiated, the Fishtown Beer Runners the club was founded a decade ago by neighborhood residents David April and Eric Fiedler to promote running and responsible drinking in what they wryly call "the interest of science." They hold weekly runs that end at different bars where the parched pavement-pounders have a beer or two and toast "the professor." That's Manuel J. Castillo, a physiology professor at the University of Granada School of Medicine in Spain and leader of a small study that showed drinking a few beers after running is a safe way to rehydrate. 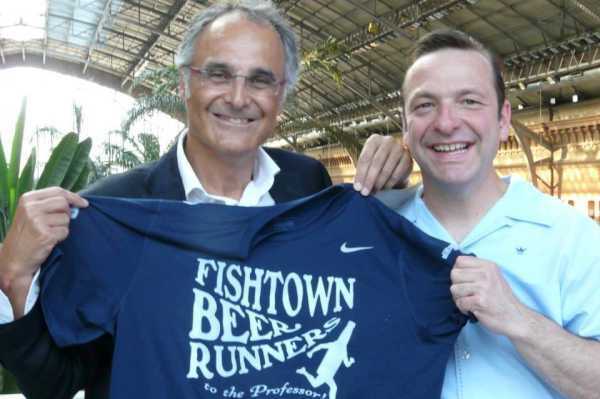 Spanish physician Manuel Castillo (left) conducted a beer hydration study that became a sort of rallying cry for David April (right), co-founder of the Fishtown Beer Runner. The fundraising event at 7 p.m. Friday in the Hamilton Building, 1001 Locust St., will feature a screening of the 2015 documentary film, Beer Runners, about the Fishtown club and its offshoots in Spain. There will be a pre-film cocktail party, plus a post-film discussion with April and Castillo. Proceeds from donations — $25 is requested — will benefit the Kimmel Cancer Center's social work emergency fund, which helps families struggling with the financial burdens of severe illness. The event also will honor April. Besides using the running club to encourage trans-Atlantic fitness, friendships and philanthropy, April is a cancer survivor, having successfully undergone treatment for kidney cancer at Jefferson. The fundraiser will be part of a four-day "beer runner's summit" that includes several fun runs in Center City and beyond, plus a symposium about the science of "beer hydration."